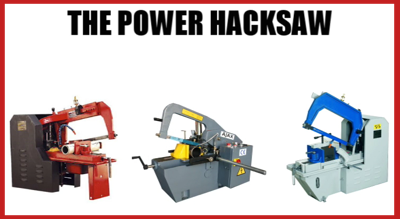 Power hacksaws are used to cut large sizes (sections) of metals such as steel. Cutting diameters of more than 10/15mm is very hard work with a normal hand held hacksaw. Therefore power hacksaws have been developed to carry out the difficult and time consuming work. The heavy ‘arm’ moves backwards and forwards, cutting on the backwards stroke. The metal to be cut is held in a machine vice which is an integral part of the base. Turning the handle tightens or loosens the vice. The vice is very powerful and locks the metal in position. When cutting is taking place, the metal and especially the blade heats up quickly. Coolant should be fed onto the blade, cooling it down and lubricating it as it cuts through the metal. Without the use of coolant the blade will over heat and break/snap. This can be dangerous as the blade can break with powerful force, shattering. When the metal is placed and fixed in the vice, the blade is lowered onto its top surface. The diagram below shows the ‘arm’ being lowered with the ‘adjusting handle’. Blades of power hacksaws are graded according to the material they are made from and the number of teeth per inch. Top quality blades are manufactured from High Speed Steel. although there are cheaper alternatives such as carbon steel blades. In general the number of teeth per inch (TPI) range from 14 to 24. The more teeth per inch - the smoother the cut. Power hacksaws have electric motors that power the blade through a pulley system. Some have ratchet systems. The pulley system shown below shows how rotary power is transferred from the motor and changed to reciprocating motion, allow the blade to cut through the material. Most power hacksaws have two pulley wheels. If the belt is placed on the smaller pulley wheel the speed of cut will be fast. Changing the belt so that it runs round the larger pulley wheel will reduce the speed. 1. Draw a power hacksaw and label all the major parts. 2. Explain how rotary motion of a motor powers the reciprocating motion of the blade. Use diagram(s) and notes. 3. List safety factors with regards to using a power hacksaw.